I've been thinking about ways with candy canes this week and I came up with a few projects, one worked and one didn't. The candy cane candle was a winner and would look pretty on a Christmas mantel or as part of a Christmas table centre piece. It took about 15 minutes to put together and was so easy you could delegate this one to the kids. As long as they don't eat it first. 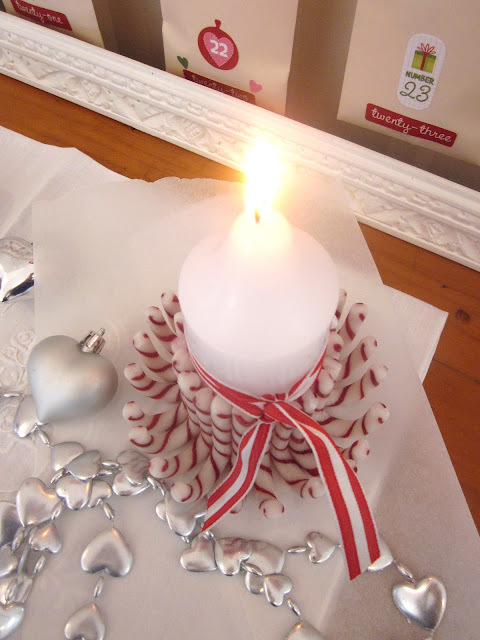 All you need is a packet of mini candy canes, a round candle, some PVA glue and some themed ribbon. Also some baking paper and cotton buds will help make this project less messy. Place your candle on some roughly torn baking paper. The colours run a little (but only a little on the underside, when the glue is still wet) so you will need to use baking paper on your tablecloth as well, just to be sure, if you are using it as a centrepiece. 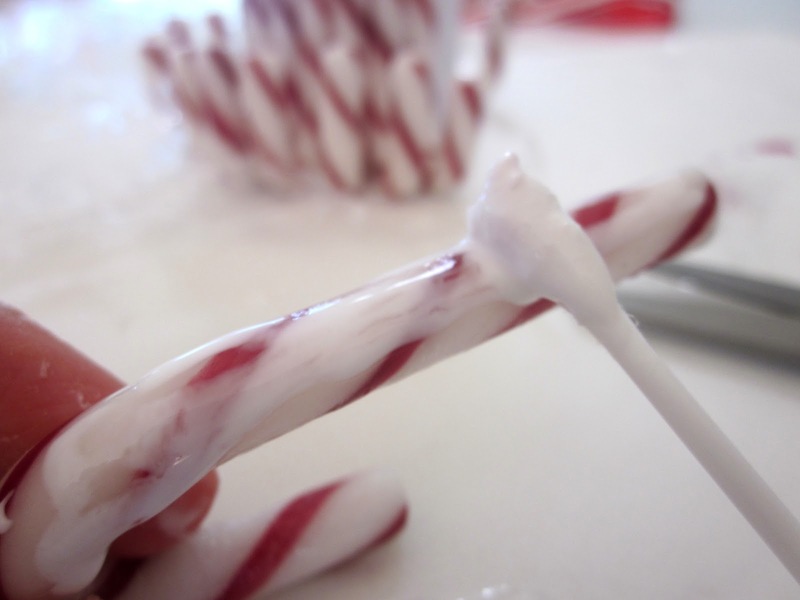 Squeeze a small dab of glue on the back of the candy cane and spread it out with a cotton bud at the back and the sides. 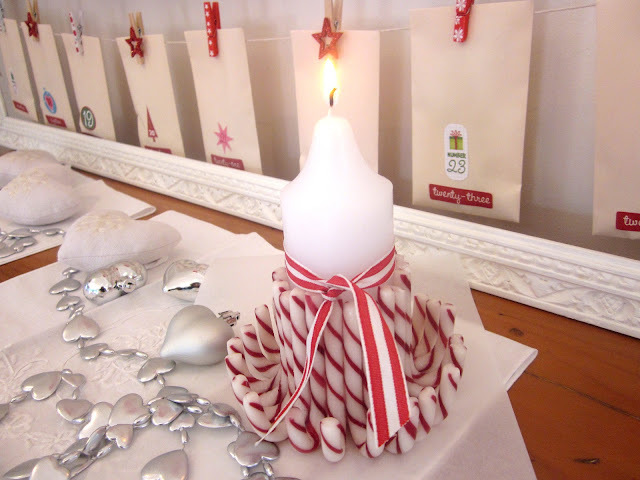 Stick the candy canes around the circumference of the candle, so they fit together snugly. 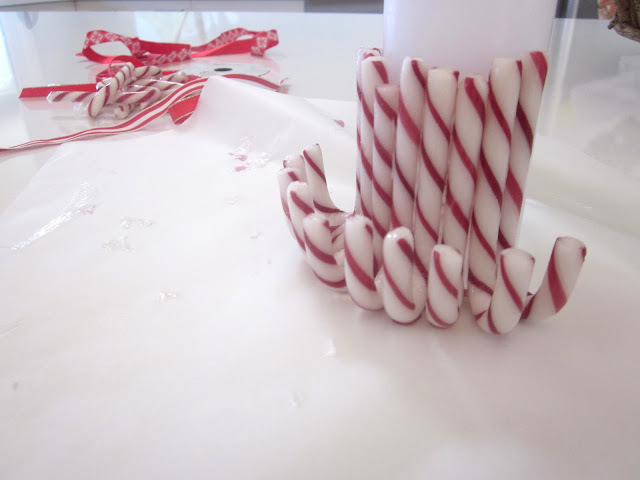 Make sure the candy canes are all the same size before you start, as far as possible. I just assumed they were and ended up with this look. The ribbon covered it up so it didn't matter, but if you are a perfectionist then match them for size first. I also had a go at making a candy cane ornament but the glue was not strong enough against the force of gravity and when I tied it up, it fell apart. I am going to try again with royal icing, as it hardens quickly and does not go soft once it has dried. 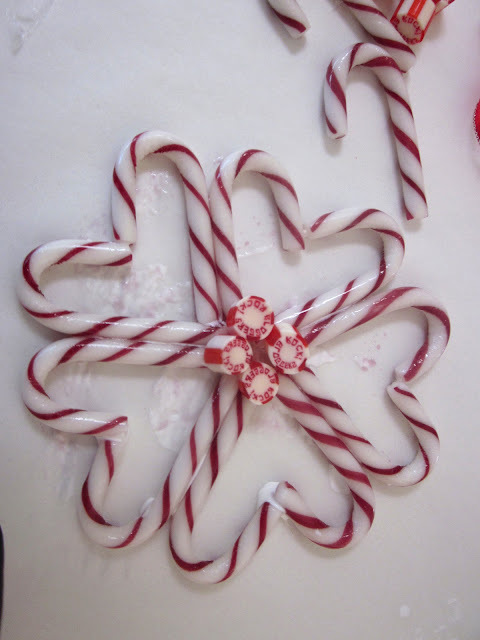 If you want to try this with royal icing you will need 10 mini candy canes and 5 lollies for the centre of the flower and some ribbon to tie it up. The Beach House Brat nicked one of the centre lollies and gobbled it up, glue and all. What a devil. She hasn't keeled over yet, so hope she's OK. So there you have it sweet people, my week in candy canes. For more quick and easy Christmas baking and craft ideas have a look here. This looks so sweet and Christmassy. Good thinkin'!!! This is lovely...I think I will give it a try! Thanks so much! I don't think they would last here, if the insects didn't get them the kids would- glue and all too! cute idea! i bet your kids love them. Great ideas and I love the hearts. So lovely!!! Fun idea! Thanks so much for sharing the great tutorial! I'd love for you to visit my blog. Great ideas! Love these! We always seem to get so many candy canes and I end up throwing them out. This is a great way to use them up! Does this adorable candy cane candle holder attract ants? We've got them and I have to kepp all candy under lock and key(or whatever). NO no ants but if you have a problem keep the wrappers on. Ours were individually wrapped. French Country Cottage links are always so fun! 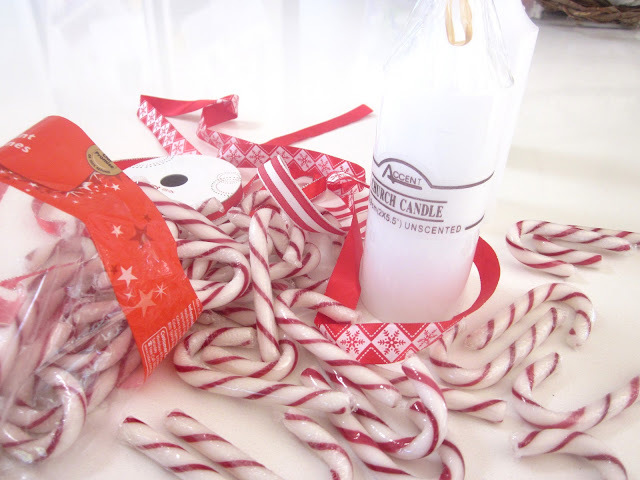 I love your blog and your candy cane idea! Gets me in the Christmas mood. oh I love this idea - I might just have to wait a year or two to try it as my youngest daughter would lick them FOR SURE! Cutest idea. I love candy cane decorations. Thank you for sharing your creativeness. Red and white always makes my heart skip a beat. 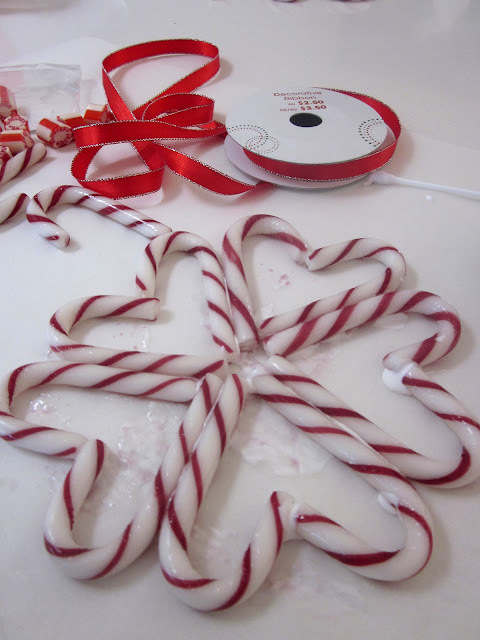 Plus I LOVE candycanes, so you must know how adorable I think this project is. Simply lovely. I'm afraid I would eat them all before the project begins...doh! I love this idea! Thank you for sharing it with us! I bet mine would eat it even though they really should know better. The hearts are lovely, would be so pretty on a cake. Oh dear, I'm not thinking decorations yet BUT will get that pudding steaming very soon. Thank you for sharing your project on A Crafty Soiree! I've featured yours in the newest one, up this week on Wednesday at 12 midnight EST instead of our usual Thursday because of Thanksgiving here in the US. Please come see it and share some more of your craftiness! Cute candy cane crafts. Love the hearts. Very pretty! I love the ornament and hope it sticks with royal icing!